Oklahoma City Thunder point guard Russell Westbrook will undergo surgery in the coming days to repair a torn meniscus in his right knee, the team announced Friday. No timetable has yet been set for his return to the court. The Thunder say Westbrook suffered the tear during the second quarter of Oklahoma City's 105-102 win over the Houston Rockets in Game 2 of their first-round playoff series. The team did not specify when exactly the tear occurred. He did not leave the game after the play — in fact, he assisted on a Thabo Sefolosha 3-pointer, picked Beverley's pocket and scored an end-to-end layup immediately after the timeout — and finished with 29 points, five rebounds, four assists and four steals in the win. Westbrook had averaged 24 points, seven assists, 6.5 rebounds and three steals per game in the series, which the Thunder lead 2-0. Yahoo! 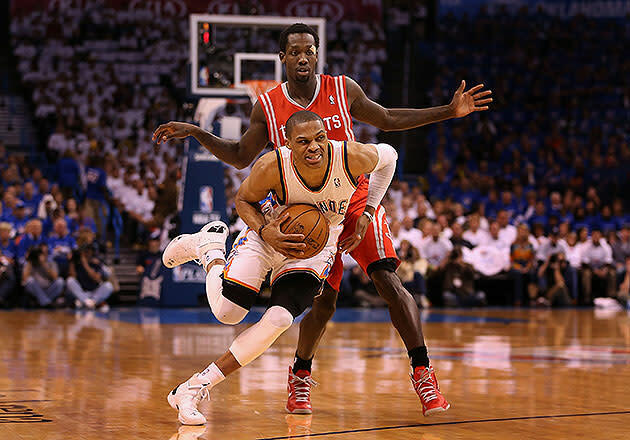 Sports NBA columnist Adrian Wojnarowski reports that Westbrook is "irate" with Beverley over the play, and you can certainly understand why — after all, he's the one who just learned he was injured and will miss time (presumably) as a result of the play, which would frustrate and infuriate just about anyone, especially a player as famously emotional and fiery as Westbrook. That said, though, it requires a very, very long logic leap to suggest that Beverley in any way had any intent to injure Westbrook or was looking to take a cheap shot at an All-Star; he was playing aggressive defense at a time when most guys don't play aggressive defense, and it resulted in a collision, and that collision resulted in an injury. It might have been a "dumb" play, as Daily Thunder's Royce Young called it, but it was a bang-bang accident. With a really, really unfortunate outcome. As you've likely heard mentioned on at least one or two national broadcasts of Thunder games over the past couple of years, Westbrook has never missed a game — not in five NBA seasons (including four playoff runs), not in two years at UCLA, not even stretching back to high school. He's been a lineup constant virtually since he started playing basketball; now, for the first time in as long as anyone can remember, he won't be in uniform when Game 3 tips off at Toyota Center on Saturday night. "We know what kind of competitor he is, how much he wants to be out there, but it's a medical decision," Presti said in a news conference. The injury doesn't necessarily mean Westbrook's done for the rest of the playoffs. Unlike tears of the medial collateral ligament (which often shelves players for somewhere between six and 12 weeks) or anterior cruciate ligament (which sidelines them for far longer than that), recoveries from meniscus tears can happen far more quickly, with the most recent example being Los Angeles Lakers forward Metta World Peace's remarkable 12-day recovery from surgery to repair a meniscal tear. Recovery times vary, of course, depending on the nature and severity of the tear, as well as the type of procedure undertaken to repair it. Al Harrington played through a torn meniscus last season (and wound up missing most of this year after complications from arthroscopic knee surgery following the season); Eric Bledsoe missed four months (but only about one month of games) after his meniscus surgery last year; Chase Budinger missed 3 1/2 months after his meniscus surgery this year; and so on. Speculating on what Westbrook's recovery might look like and when it might take place would be extremely premature, especially considering he hasn't even had the surgery yet. Wojnarowski cites a source who says the tear is "considered to be minimal — perhaps 2 percent of the meniscus, one source said," but what exactly that means remains unclear. There's a lot we don't know right now, and that will continue to be the case for a little while. What we do know, though, is that for the first time in five years, the Thunder are about to head into a game without Russell Westbrook in the lineup. That's going to require some regrouping for an Oklahoma City team that has been able to count on Westbrook being on the floor for more than 70 percent of its total minutes in each of the last four years. On one hand, the Thunder seem uniquely positioned to handle the loss of even a player as important as Westbrook, thanks in part to the presence of capable, efficient secondary and tertiary scoring options like Serge Ibaka, Kevin Martin and Nick Collison, but due primarily to the leaps and bounds Kevin Durant has made in his all-around game this season — and especially as a facilitator, as evidenced by the difficult penetrate-and-dish kickout he made to Thabo Sefolosha for the game-sealing 3-pointer in Game 2. On the other, Durant gets more 3-point looks (5.3 per 48 minutes with, 4.3 per-48 without), makes more (2.2-per-48 compared to 1.6-per-48) and hits at a higher percentage from deep (42.2 percent compared to 37.8 percent) when Westbrook's on the floor than when he's off, according to NBA.com's stat tool, and has to do way more work on his own without Westbrook. Nearly 56 percent of Durant's baskets came by way of a direct assist with Westbrook on the court this year, and that number goes down to just under 32 percent with Westbrook out, while his share of unassisted baskets (makes he creates himself in isolation and off the dribble) skyrockets from 44.1 percent when Westbrook plays to 68.2 percent when Russell sits. Having to create more than two-thirds of your shots by your lonesome seems like an awful heavy burden for Durant to have to bear over the course of a long playoff run against tough defenses. It will be incumbent, then, on Thunder coach Scott Brooks to figure out how to divide up Westbrook's ball-handling, playmaking and scoring responsibilities; headlined, one suspects, by many more minutes going to reserve point guards Reggie Jackson and Derek Fisher — without hugely overburdening Durant. "I'm confident in the guys we have," Presti told reporters Friday afternoon, according to Daily Thunder's Royce Young. "I'm confident in our coaching staff." Confident or not, the loss of Westbrook for any significant period of time represents a major blow to the title chances of an Oklahoma City team that won a Thunder-franchise-best 60 games this season (the former Seattle SuperSonics won more three times) to earn home-court advantage throughout the Western Conference playoffs and has its sights set on a second straight trip to the NBA finals. Even if Westbrook is able to return quickly, it's uncertain how close he'd actually be to the fearless, explosive All-NBA-caliber scorer and facilitator that we've seen over the past five years, especially coming back from the first significant injury of his basketball life. It's tough to quantify and project that kind of stuff; again, there's just so much we don't know. We'll learn much more about Westbrook's prognosis, the Thunder's chances and how wide this opens the Western Conference door to other contenders — most notably the Los Angeles Clippers and Memphis Grizzlies, because the winner of their series will face OKC in Round 2 — in the days ahead. Right now, though, this much is certain: As long as Westbrook's unable to lace them up, we've all lost the chance to watch something pretty awesome and someone pretty breathtaking. Get well soon, Russ. If the first clip above isn't working for you, feel free to check out the video elsewhere, thanks to SI.com's Ben Golliver.